The Ministry of Health and Population, in cooperation with the World Health Organisation (WHO) and the Ministry of Education, has launched the second phase of a national campaign to eliminate intestinal parasites (worms) in primary school children across the country. The national campaign is targeting 12.5 million children aged between 6-12. Parasitic infection remains a serious public health problem the world over, especially in developing countries, and represents a major cause of morbidity and mortality in childhood and among high-risk groups in most parts of the world. Treatment includes two chewable tablets of Mebendazole 500mg to prevent infection from intestinal parasites. The medicine is safe and the most commonly used to treat intestinal worms in children, Minister of Health and Population Hala Zayed said at a press conference, adding that the campaign aims to decrease the prevalence of intestinal parasites and prevent associated complications (diarrhoea, anaemia and malnutrition) that could ultimately affect the growth of school-aged children. Such parasites can be easily transmitted by contaminated hands. Intestinal parasites can also be easily transmitted either by eating unclean vegetables and fruits or those contaminated with parasitic eggs. More than 20 million tablets are being used in the campaign according to Alaa Eid, head of the ministry’s Preventive Medicine Department. 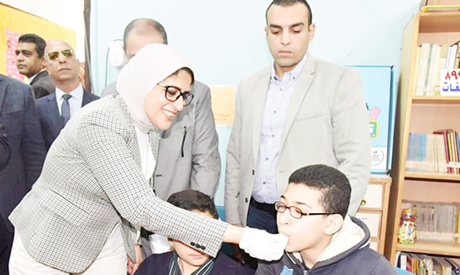 Ministry of Health and Population Spokesman Khaled Megahed noted that the campaign is part of the ministry’s various health initiatives launched for school students as part of the president’s initiatives to safeguard the health of Egyptian children. Other campaigns have been held to detect obesity, anaemia and stunting among school students, Megahed said. He said the ministry, along with the Ministry of Education, is raising the awareness of students about personal hygiene as a means of avoiding parasite infections. Intestinal parasites among school students is around 31 per cent, Megahed said, adding that 64 per cent of boys were found to be infected while infection among girls was around 55 per cent.